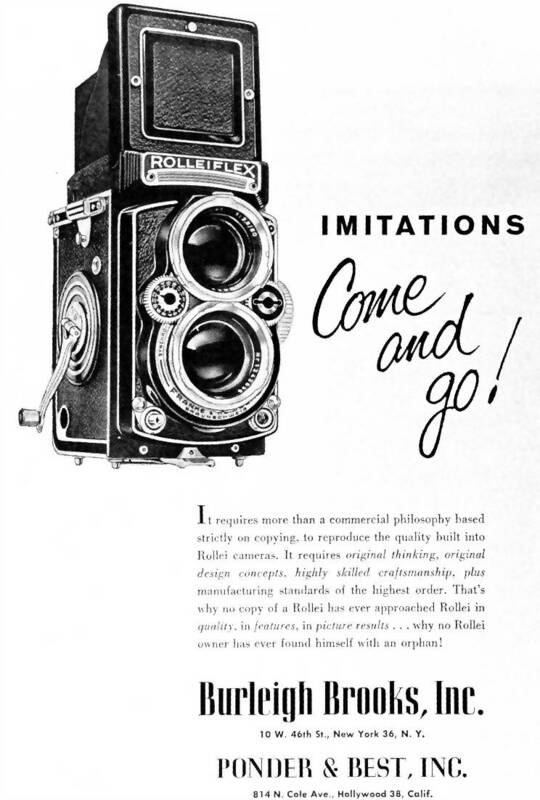 Mamiya started out with a fairly low-end conventional TLR in 1948, following up with a number of quite classy Rollei-type models, most using its own Sekor lenses, sometimes Olympus Zuiko ones. Then in 1957 it went for the professional market in a big way, with the giant “C” series of folding models with interchangeable lens sets (different series, chrome and black, all Sekor, copied in concept from the unsuccessful French Rex Reflex interchangeable-lens model of the early fifties), eventually ranging from 55mm to 250mm. The three photos immediately below are from a photoshoot which Ivor Matanle organised with my cameras for his April 2006 article in Amateur Photographer. They show four of my early (pre-C-series) cameras, the three earlier C’s, and then the C200 and C330, the late models. Following these pictures is the key section listing each camera individually – click on the thumbnail pic in each case to see larger versions. The DEFINITIVE website for Mamiya C-series cameras is Graham Patterson’s Mamiya System Summary. I’m not sure he’s still maintaing these pages, as he told me a while back he’d moved to California with his work, but the tables and other information provided are a vital resource if you’re researching these unique cameras. In May 2006, Ivor Matanle published an article on Mamiyaflexes in Amateur Photographer, in which he used my cameras for all the photos. This is reproduced HERE by kind permission of Gary Coward of AP. The first of the line 1948 – fairly basic. This one is the second of three main variants, all front-geared focussing. “Made in Occupied Japan” on winder. Continuation of the front-geared line from 1951. The Mamiyaflex I and II are superficially very similar, but this one has no underline on nameplate. Very similar to Mamiyaflex I of previous year, but has sports finder, self-timer and cocking by film wind-on. Mamiya was starting to move up-market. The classier A/B series were quite advanced – from c 1949. First Japanese Tlr with auto-filmstop, two dials for setting speed/aperture. Well made feel. The C series (early ones badged “Mamiyaflex”, later ones just “Mamiya”) were a major departure in TLR development, using bellows for close focusing (dowwn to 7″) and a wide range of interchangeable paired lenses. The original C Professional was launched in 1956/7, and is very rare, with production rapidly swithched to the improved C2 (right). It is distinguished by having only one focus knob (usually on the right, although I believe some left-handed ones were made. The C2 was launched in 1958, improved mainly by two focus knobs rather than one, by a removable hood and the Seikosha-S shutter on the standard lens. Rack extension/ bellows focus down to 7″ transformed the TLR market. SHutters were also improved. The C33 series succeeded the C3 c 1965. Film-advance crank now tensioned the shutter. Automatic parallax compensation. The first of this series was the C2, succeeding the Mamiyaflex C. The C22 (1966) is a lighter body with knob advance. 120/220 backs available. Followed the C22 (1968). Small crank on wind knob. Single back takes 120/220 film. Later (1982) succeeded by a C220f with minor improvements. Last of the line (1983) after intermediate C330f. Lighter body, parallax indicator in viewfinder. Still widely used, top-quality camera. The linked page (click thumbnail) has a picture of a strange “Special Edition” of this camera.